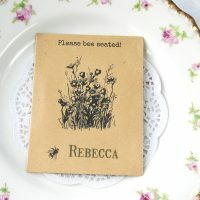 Tags: bee seeds, lavender seeds, seed packet favours. We do love bees! And bees love Lavender! 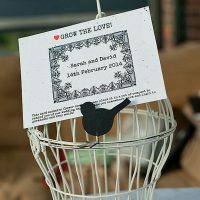 So our recycled lavender seed packet wedding favour for bees ticks both boxes! You look at any Lavender bush when it’s flowering and we guarantee it will have any number of bees feasting on it on a sunny day! 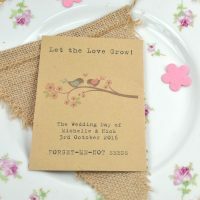 This Lavender seed packet wedding favour is made from quality recycled lilac-coloured paper and measures 9 x 12 cm. The Lavender seeds (Vera variety) are in a sealed plastic wallet and the sowing instructions are printed on the back. Please let us know your personalisation details above. You will get around 50 or so Lavender seeds. Lavender was known as Elfleaf and Spikenard many years ago. Its Latin name Lavendula comes from the Latin, “to wash” – the Romans used to add it to their bath water. It is said that Lavender possessed no scent at all until the Virgin Mary spread Christ’s swaddling clothes on a Lavender bush to dry, when from this time it adopted its characteristic scent. It was an ingredient in “Four Thieves Vinegar”, which was supposed to render immunity from plague to those who robbed plague victims after death. Carry Lavender and you will be able to see ghosts. Plant around the outside of the house to keep out evil spirits and bad luck. Lavender is a very useful, versatile herb. Turner’s herbal of 1551 recommended sewing Lavender into a cap to aid the brain. Spouses who place Lavender flowers in their bed will never quarrel. Charles VI of France insisted on having Lavender cushions available to sit on wherever he went. Elizabeth I ordered her gardeners to have fresh Lavender flowers available every day. In Medieval and Renaissance Britain, washer women were known as lavenders – they dried laundry on Lavender bushes to help scent the material. In seventeenth century London, during times of plague, people were advised to wear a bunch of Lavender around each wrist to protect from plague. A Lavender disinfectant can be made by simmering the leaves and small stems for 30 minutes. Strain and use. Placing a sprig of Lavender behind the ear may cure a headache. Lavender oil was used as an antiseptic in World War I, treating ulcers, sores and burns. Massage a couple of drops of oil into the temples for a headache. It takes up to 150 lb of flowering tops to produce 1 lb of essential oil. Apply the oil to a nit comb and comb through the hair to help eliminate headlice. The Victorians made a furniture polish from Lavender. It was also a major ingredient in most smelling salts of the time, which were used as a remedy for fainting. A couple of drops of oil on your pillow can help insomnia, or place some Lavender in your pillow. Lavender also fights inflammation and infection. Use it to treat eczema, psoriasis, dermatitis and athlete’s foot. Lavender oil also neutralises poisons in insect and snake bites. To make a Lavender skin toner, infuse Lavender buds in witch hazel extract for two weeks. Strain and mix with spring or rose water. Good for oily skin. Lavender bath – steep a handful of dried Lavender buds in boiling water for 20 minutes. Strain and pour liquid into bath. Lavender is a fantastic plant for bees – they absolutely love it! Always seek the advice of a qualified herbalist before using – the above is for information purposes only. Sprinkle the seeds onto a pot or tray of peat-free compost. Cover them with a light layer of compost. Water. Place somewhere warm and light to germinate. Once the seeds have germinated and you have healthy little Lavender plant seedlings, carefully remove from the tray, one at a time, and replant into a small pot. Grow on and keep repotting until you have a small Lavender bush that you can plant into sunny well-drained part of the garden. Can also be grow in big pots – just remember to feed them occasionally.